(U) With the expanded use of Huawei Technologies Inc. equipment and services in US telecommunications service provider networks, the Chinese Government’s potential access to US business communications is dramatically increasing. Chinese Government-supported telecommunication equipment on US networks may be exploited through Chinese cyber activity, with China’s intelligence services operating as an advanced persistent threat to US networks. Huawei has been identified publicly for selling or attempting to sell US intellectual property to export restricted countries (Iran/Cuba), making it a clear threat through its targeting of US economic and proprietary information. China makes no secret that its cyber warfare strategy is predicated on controlling global communications network infrastructure. (U/ /FOUO) Huawei is a threat to intellectual property and business communications due to its opaque relationship with the Chinese Government. Huawei has legal obligations to work on behalf of the Chinese state, probably through the Chinese Communist Party (CCP) committee residing within Huawei. This relationship likely influences the company’s decision-making through threats of corruption investigations. (U) Since Huawei’s inception in 1987, the company continues to receive open support from senior Chinese Communist Party officials and People’s Liberation Army (PLA) Commanders. With over $100 billion in Chinese Government subsidization and direct financing, Huawei is able to offer unsuspecting US businesses low-cost offers difficult to refuse in exchange for access to US networks. (U) The purpose of this SPIN is to provide summaries of recent US and British Government investigative findings, private I industry reporting. and news articles on Huawei Technology Inc.
(U) Internet exchange points (IXP) use a host of networking equipment, including sophisticated routers and switches, which enables traffic to be properly routed. This equipment is comprised of integrated circuits that can be severely impacted, thereby modifying functionality, including backdoors and/or kill switches. Although hostile actors manufacturing such products could conceivably target all integrated circuits to be used in routers, they might instead target integrated circuits used in the most sophisticated equipment. The Internet in the United States could theoretically be brought down or severely disrupted because the routers and switches serving the IXPs were disabled. Traffic would no longer be routed between networks, except where carriers had their own private peering arrangements. (U) The United States should view with suspicion the continued penetration of the US telecommunications market by Chinese telecommunications companies -United States House Permanent Select Committee on Intelligence (HPSCI), Investigative Report on the US National Security Issues Posed by Chinese Telecommunications Huawei and ZTE, October 8, 2012. 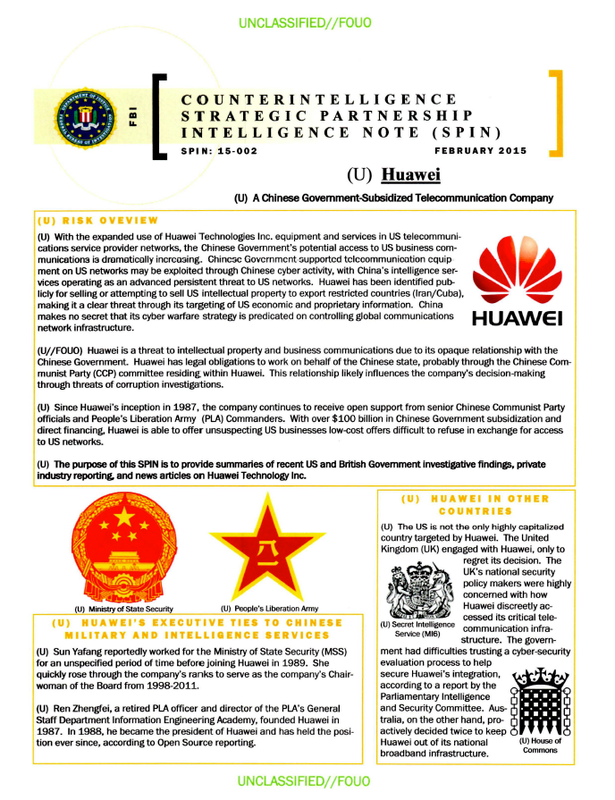 (U) HPSCI Recommendation: Private-sector entities in the United States are strongly encouraged to consider the long-term security risks associated with doing business with Huawei for equipment or services. US network providers and systems developers are also strongly encouraged to seek other vendors for their projects. Based on available information, Huawei cannot be trusted to be free of foreign state influence and thus poses a security threat to the United States and to our systems. (U) Overview: The threat posed to US national-security interests by vulnerabilities in the telecommunications supply chain is an increasing priority given the country’s reliance on interdependent critical infrastructure systems, the range of threats these systems face, the rise in cyber espionage, and the growing dependence all consumers have on a small group of equipment providers. China has the means, opportunity, and motive to use telecommunications companies for malicious purposes. Suggested “mitigation measures” cannot fully address the threat posed by Chinese telecommunications companies providing equipment and services to US critical infrastructure.